It’s very easy to pin a record from the library catalog to one of your boards. 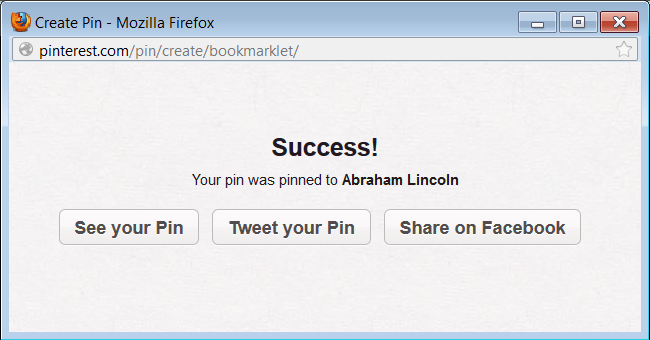 I’m going to assume that you have already added the Pin It button to your browser’s bookmarks toolbar. If not, you’ll find more information on that on the Pinterest Goodie page. Go to the full record page in the library catalog, and click on the Pin It button. 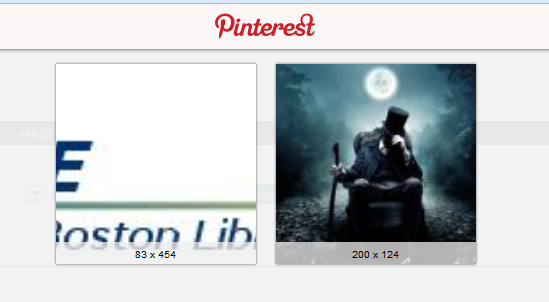 Pinterest will give you a choice of which image you want to choose, the logo or the cover image. Click on the cover image. Click Pin It, and you should see the Success message, with option to see your pin, tweet it or post on Facebook. What do you want to include in the Pin description — just the title and author or a summary or recommendation? It’s totally up to you, and it may depend on the nature of the board. For example, a board that’s called “Picture Books about Butterflies” may not need summaries, but for a board called “Staff Favorites” you may want to add more information, like who selected it and why. When I first started pinning books from the catalog, I added the summaries from the catalog to the description because I thought that made it a better booklist, but I stopped doing that routinely because I just felt it made the board look to cluttered. Also, speed was an issue — the more time I spent editing each pin, the more time it takes. You may want to leave the description blank, and assume that the cover images themselves display the titles in an attractive, graphic way. One problem with this is that for some cover images, the title isn’t clear on a thumbnail image. Also, having the title and author on the page makes it easy to find a particular book on the page, using the browser option to find text on the page. I use this all the time when I want to add more images to an existing board, and can’t remember if I have already added a particular book. Doing the Find command and a quick search is easier for me than trying to spot the matching cover image in a sea of red and pink hearts on the Valentine’s Day board! If you highlight text on the page before you click the Pin It button, that’s the text that will appear in the description. For an example, see this pin: Katy and the Big Snow. You can use this same technique to create other search links. 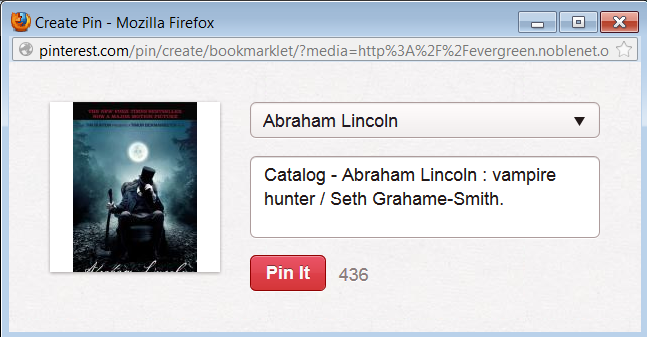 For example, you could have a board called Explorers and pins for Columbus, Magellan, etc., with each being a catalog search link displaying a single cover image but linking to multiple titles. If there’s no image, there’s no way to add a pin using the Pin It button. You’ll need to find an image from another source, or create your own. (You could make your own READ style photos of someone holding up the open book!) Once you have the image on your computer, go to the Add+ menu, choose Upload a Pin. Browse and select your image. You then have the option to select a board, add a description and save your pin. You’ll need to edit your new pin to add the URL to a the catalog link to the individual catalog record or an appropriate search. 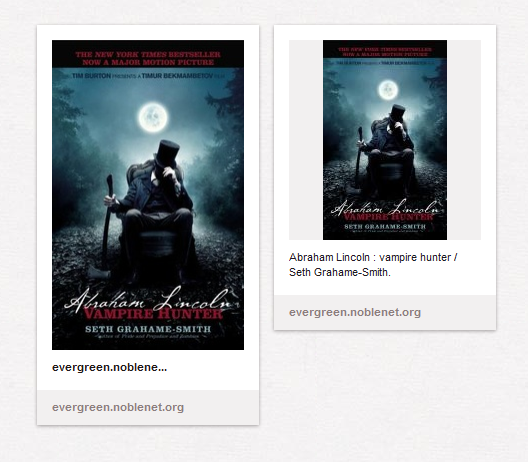 Note: These examples use NOBLE’s Evergreen catalog, but should work with most other library catalog systems.